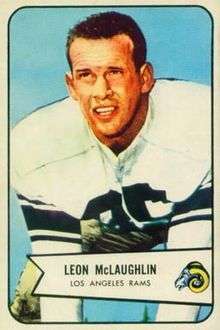 Leon Clifford McLaughlin (May 30, 1925 – October 27, 2014) was an American football player and coach. He played professionally as a center for five seasons with the Los Angeles Rams of National Football League (NFL). After his playing career he served as assistant coach for several NFL teams: Pittsburgh Steelers (1966–68), Los Angeles Rams (1971–72), Detroit Lions (1973–74), Green Bay Packers (1975–76), New England Patriots (1977), and St. Louis / Phoenix Cardinals (1978–89). McLaughlin was the head football coach at San Fernando Valley State College—now known as California State University, Northridge—from 1969 to 1970.